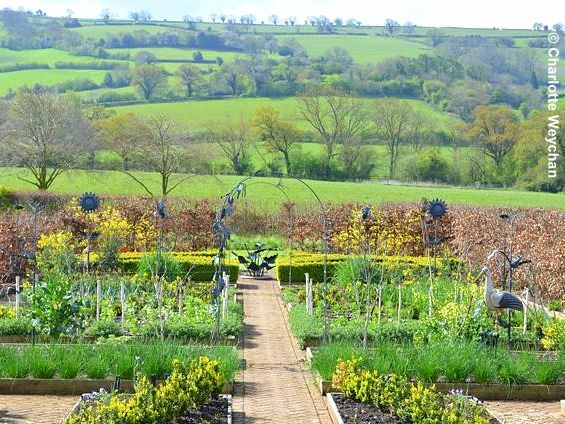 Deep in a Somerset valley there's a garden with a difference - Holt Farm Organic Garden. It's very refreshing to find a "nouvelle" garden in every sense of the word - new because it's only just beginning, but also approached with enthusiasm by its creator, and some interesting ideas, including an annual wildflower meadow that has yet to show its potential this year. Set in stunning countryside, this is a colourful oasis at the bottom of the valley. Walk into the garden there and you'll soon realise you're dealing with something unusual. 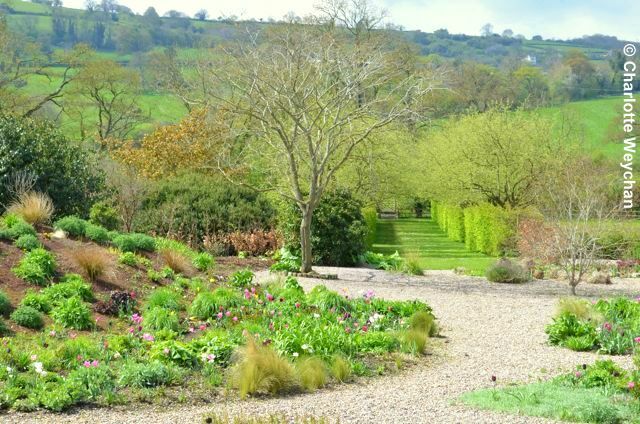 There's always been a garden here - tended by the family that lives in the house - proprietors of Yeo Valley Farm next door, which produces much of Britain's organic yoghurt, but it's Sarah Mead, who married into the family several years ago who's breathed new life into the six and a half acre plot. She's the first to admit she's been bitten hard by the gardening bug and learned to love the land. Combine this with her passion for all things organic and you've got an interesting project and a real labour of love. 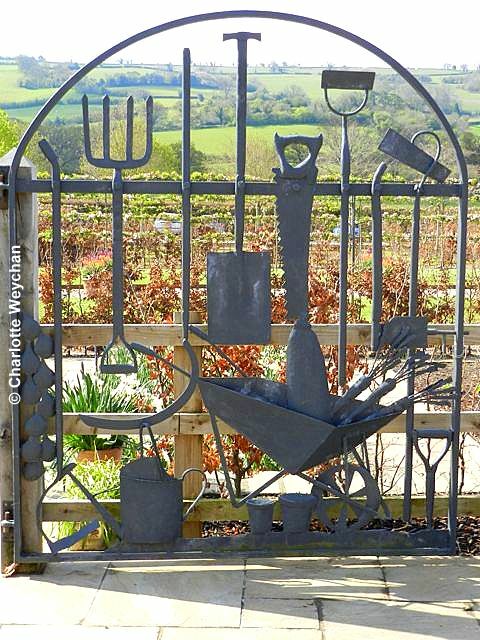 The garden here is reminiscent of "nouvelle cuisine" - a little of this and that presented on a landscape plate and designed to appeal to the eye. But seeing it this early in this season left me a little hungry, because although it tasted good, I wanted more! This is early days for a new garden, and I'm sure it will mature like fine wine. 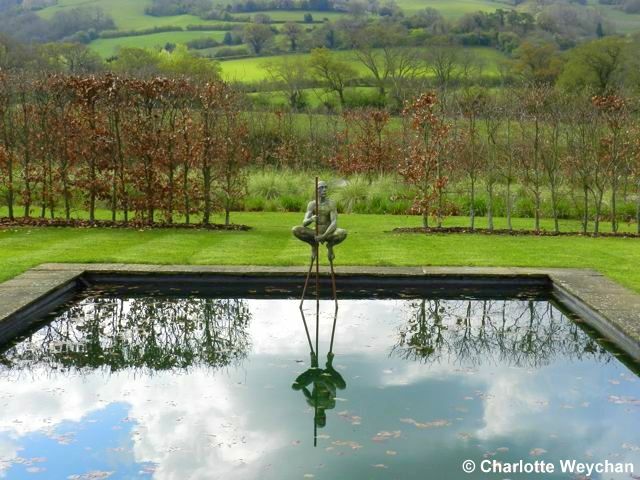 Sarah Mead is experimenting with her new-found enthusiasm and making a contemporary garden in a beautiful setting. 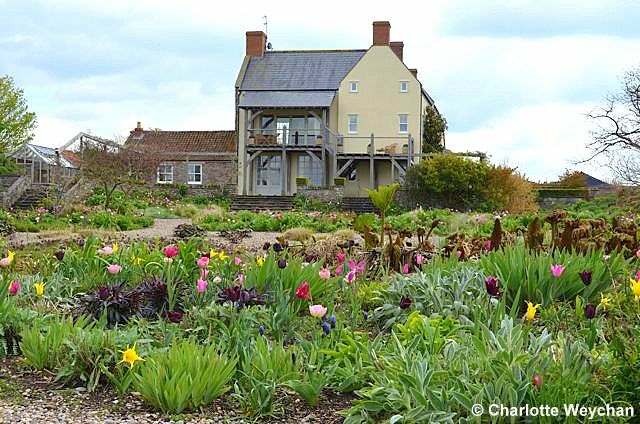 There's enough to see here, including a well-stocked vegetable garden (above), gravel garden, perennial and annual meadows - sadly too soon to see the latter in full bloom. 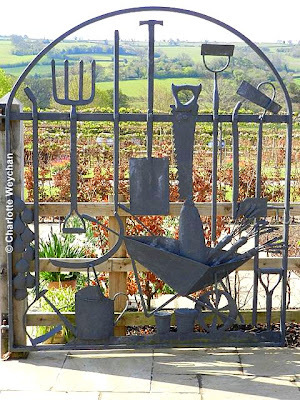 All punctuated with some unusual wrought iron metalwork like the gate (left), by local artisan James Blunt (who we were assured is no relative to the singer) and organically certified by the Soil Association. 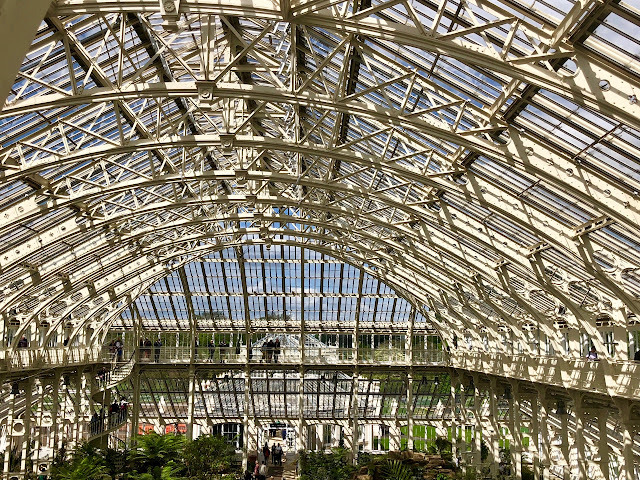 But opening hours are very restricted - the garden is only open to the public one full day a week, on Thursdays from 10.00 to 5.00 and the first Sunday of each month (2.00-5.00), from now until the end of September. 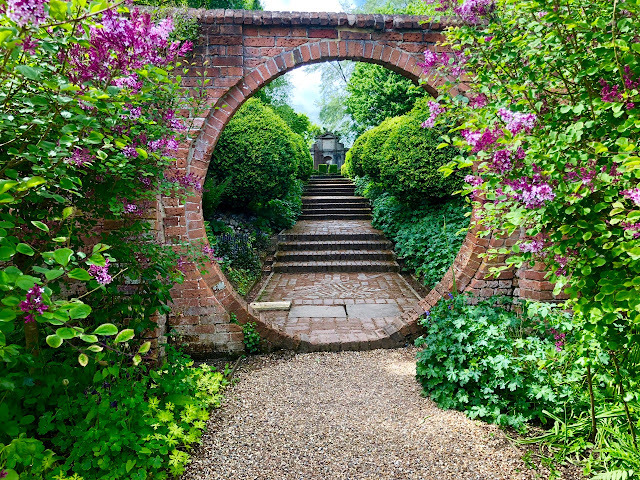 And while there's an excellent restaurant here to shelter from the English weather, you will want to combine this with other gardens in the area if you want to leave the area feeling satisfied. But fortunately, Holt Farm is part of the Somerset Gardens group which includes Cothay Manor, East Lambrook Manor and Lytes Cary, so you can choose this as your starter and move onto one of the others for main course and dessert! I understand why they are only open one day a week....need to get chores done. A beautiful garden! While I might never have a formal pool like that (let's face it; a more "naturalistic" pond is easier to fit into most gardens), a boy can dream, can't he? A beautiful place, Charlotte! The setting reminds me of Tuscany or California's wine country or the rolling hills of Pennsylvania. The veggie garden looks well-stocked. Very impressive!